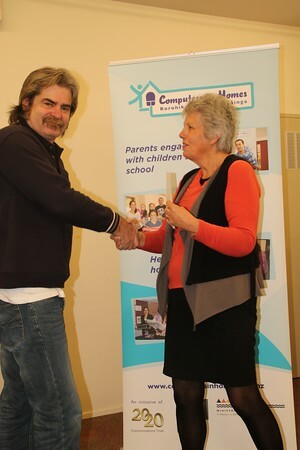 Term 2 has ended with a round of different natured people who i must say enjoyed doing the Computers in Homes program and looking forward to do whatever else they are able to do. We graduated 32 people all up in this term. Mauriceville School - 10 , Ko Te Aroha (morning) - 9, Afternoon - 6 , Evening - 7 all these graduates are from all different schools that are under our program. Out of the 32 we have 8 that signed up for internet 2 of them are on UFB. Term 3 is underway with a class of 8 at Ko Te Aroha hopefully we can graduate them the last week of school for this term. The lovely lady in red is our lovely Mayoress of Masterton Lyn Patterson who did all our presentations to our graduates. Martha has organised 3 classes for Term One and they are all underway. Two are at Ko Te Aroha and one at Lakeview. These are the only places where we can offer Windows 7 training. Lisa is again our wonder tutor and we are all looking forward to seeing the progress of the students. We are delighted to include some of our Kaumatua this term, who are grandparents to students from our key groups. At this graduation we had Te Kura Kaupapa, Ko Te Aroha and Makoura graduates. It was a packed house, beautiful atmosphere. The feedback from the whanau supporters was great and the students got up to speak which was good and they said the same as the Lakeview graduates . Here is an example, one father said if it wasn't for this course to teach him even how to turn on a computer he wouldn't of bothered about it only because his 6yr old son kept telling him he had to get one to help him with his school work. Also the kai was yummy. Principal Pirihira Haira Of Te Kura Kaupapa O Wairarapa presenting Raewyn and Adrian Thompson with their C.I.H.certificates. 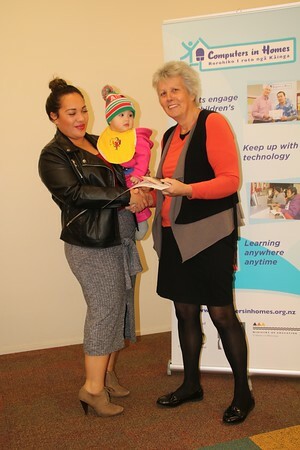 Chairman of Ko Te Aroha, Peter McNeur presenting Marata Ihaia with her C.I.H. certificate.